Seeing Mrs. Frisbie's memories of early days brings back to my mind some fond memories of my early days. I was born in Pinckneyville, Ky., the 10th of February, 1844. My father, Blake Travis was a river man. He died when I was six months old and left my mother with four little children to raise, the oldest being but eight years old. I remember the first school I went to. It was close to the little village of Levias. It was a log house and was taught by a man named King. The old Union church was a large log house and both stood where the graveyard now is. The first dead person I ever saw was buried there, a young lady by the name of Samantha Fritts. I have never forgotten how that dead face looked. I can see it as plain today as I did then. The first physician I ever saw was Dr. Jordon Bass. He lived in old Salem and was drowned in the Cumberland river. The first minister of the gospel I remember seeing was Uncle Collin Hodge. The first lawyer I ever saw was Uncle John Blue, father of Johnnie Blue that lives in Marion now. The first political speech I ever heard was made by David Woods at the place where New Salem church now stands. There are only two houses on the road from Salem to Marion that was there when I was a child, the Alvis house and the one where I live, then owned by old Dr. Miles. George Miles lived then where Jim LaRue lives now. Old Man Pressly Gray lived about half a mile below this place. The old Gray house burned down some ten or fifteen years ago. I think George Gray of Marion was born in the house where I live now and I believe Judge Rochester was born about two miles from here on the Princeton road but the old house is gone now. There is a graveyard on the hill back of my house where several of the Grays are buried one of whom is Miss Barbara. The first couple I ever saw maried [sic] was Elias Burklow and Marietta Watson. I remember when Miss Kittie Colman [sic] was married. We were all invited and what a nice basket of good things Aunt Narcissa sent my mother. You hardly ever saw cake those days except at weddings. I remember when this part of the country was almost a wilderness, just a few houses scattered around. The Alvis place, Grays, Miles, Threlkeld, Rochester, Uncle Henry Coleman's and the Clements place on the road. The Wash Brown place, Asa Hodge, Butler and Henry Watson places were all the farms close around and now most all is cleared and under fence. I remember when wild turkey and deer were plentiful. There were wolves, wild cats and panthers. My grandfather killed a large panther in old Clifty Hollow. Well I will tell you how the men and women worked in my day. In the winter and fall they cleared the land of all large timber and when spring came they had the log rollings. They would invite all the neighbors, put the logs in big heaps and burn them. There was no demand for lumber then. The women would all come and there would be a quilting the same day and what a time we would have. The dinner would consist of hog jowl, turnip greens, boiled ham, chicken, dried peach and apple pie, New Orleans molasses, milk and butter, plenty of eggs and sometimes turkey and deer. Every one was friendly, sociable and full of fun. They worked oxen those days instead of horses and after the logs were burned old "Buck" and "Bright" were hitched up and what a snapping and breaking there would be with those hickory and white oak roots. In the fall would come the fodder pulling and corn gathering. The farmers would pile their corn in a big pile, close to the crib, invite all the neighbors and have a corn shucking. There would be a jug at the bottom of that corn pile and they never stopped until they found jug. I can remember hearing the darkies coming down the hill from Uncle Henry Clements singing "We Are Rounding up the Corn Pile Julia. Corn was 25c a bushel and a man would work all day for the same sum. Whiskey sold for 25c a gallon and most every one kept in the house, but you seldom saw a drunk man. The neighbors would all visit then and have a good time. They did not gossip and talk about each other then. Now the telephone has taken the place of visiting. We had no telephones in those days, nor automobiles and very few buggies. The farmer had very few implements to work with, a plow and hoe and wooden harrow was about all they had. They had no mowers, binders and cultivators in those days. The checked their ground off, dropped the corn by hand and covered it with a hoe. What wonderful inventions have been made during the past 75 years! Now we have our railroads, telephones, telegraph, electricity and at last we have the airplanes. What will be invented next? Every one worked in my early days. The women folks made all the clothes, they raised their own cotton, they carded spun and wove it into bed sheets, table cloths and dresses. They raised their own sheep, the wool was sheared, carded, spun and woven into blankets and jeans to make men's and children's clothing. Did any of our young people ever see flax growing? It is beautiful after it gets so old. They pull and lay down to dry, then they have what they call a flax break. They take the flax and beat on the flax break until they have the outside bark off, there was a single board which they used to get the bark all out. Then comes the hackle, it was a plank full of sharpened nails through which the flax was pulled until all of the tow was out. They made tow cloth out of this and linen out of the flax. How many living today ever saw a "flax wheel?" I remember the first clock I ever saw. It was here at this place when Dr. Miles lived here. It stood on the floor and reached to the ceiling. There were no coffee mills then. They had an iron jar we put the coffee in and beat it with a piece of iron. There were no sausage mills. The men would split open a large log, take out one half and hollow it out, put the meat in there and beat it with a hammer, taking three or four days for this work. When I was a little child I did not know there was such a thing as "Santa Claus." Lots of little children did not know what a toy was. If they got a new pair of shoes for Xmas that was all and they were made at home. Now young people you can see how we old people were raised. Well I have lived to see my 75th Christmas. I wil[l] close wishing every one a happy and prosperous 1920. Source: Crittenden Press. (Marion, Ky.) 1919-Current, January 16, 1920, Edition 1, Image 1 - Chronicling America - The Library of Congress. 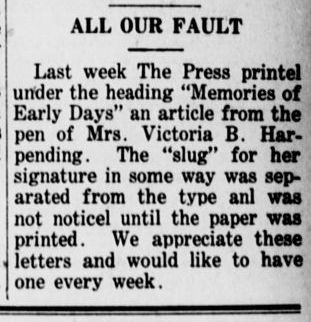 Last week The Press printel [printed] under the heading "Memories of Early Days" an article from the pen of Mrs. Victoria B. Harpending. The "slug" for her signature in some way was separated from the type anl [and] was not noticel [noticed] until the paper was printed. We appreciate these letters and would like to have one every week. Source: Crittenden Press. (Marion, Ky.) 1919-Current, January 23, 1920, Edition 1, Image 1 - Chronicling America - The Library of Congress.